Despite chapulines’ familiar flavor profile, the experience can take some getting used to for first-timers—the legs, antennae, and wings can tickle diners’ throats. While many newcomers are reconsidering grasshoppers due to advocacy by environmentalists, who point to insects as a sustainable and healthy source of protein, the bugs have a long history in Oaxaca. Grasshopper-gathering traditionally happens in agricultural fields during the rainy season. This means chapulines remain a seasonal dish—at least until raising grasshoppers like livestock becomes more common. 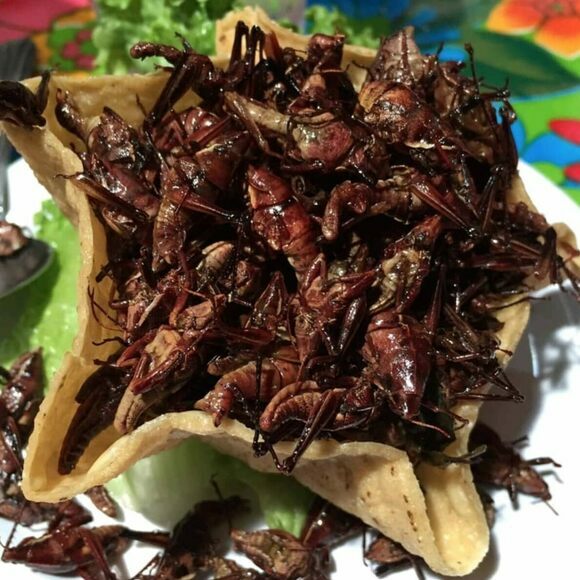 Frying chapulines makes a a pot of hearty protein that Oaxaca denizens use like carnitas or carne asada. They pile them in tortillas with salsa and guacamole, add them atop tlayuda (a Mexican flatbread akin to pizza), and snack on them by the handful, entirely plain. If you’re curious about adding insects to your dinner plate, tortilla-wrapped chapulines are a great starting point. One Zagat reviewer compares them to “the crunch of fried chicken skin and the taste of mushrooms mixed with shrimp.” Don’t be surprised if you find yourself reconsidering Taco Tuesday after your first few bites. In Oaxaca, chapulines are easily acquired during "tiempos de agua"—the summer rainy season. They're sold by the scoop in street markets and featured on select restaurant menus. Smaller chapulines are generally considered culinarily superior. An Oaxacan outpost for chapulines served plain or with jalapeños, oaxacan cheese, and avocado. At this Oaxaca contest, artists turn purple produce into stunning depictions of saints, buildings, and La Pietà. On the riverbanks of Oaxaca, cooks make “stone soup” with hot rocks and fresh fish.